With the recent storm you have plenty of snow. So get out and enjoy it! 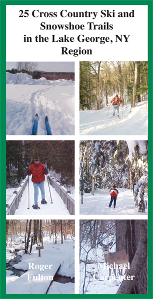 We've got THE definitive book for you to find places to x-country ski and snowshoe in the Lake George region. Our retail outlets are having trouble keeping it in stock. If you can't get it from them, you can order online at: http://www.rogerfulton.com/. We'll take PayPal payments up until January 31st.